Kempff was a pianist gifted with a towering (yet humane) artistic stature, and it is a surprise that there are relatively few CDs on the market right now that are devoted exclusively to his pianism. (Three two-disc sets in the Great Pianists of the 20th Century series have been devoted to him, however – as much as have been given to any other pianist.) This new Music & Arts release, then, is that much more welcome. Later versions of his "Emperor" Concerto (with conductors Paul Van Kempen and Ferdinand Leitner) are available from Deutsche Grammophon; with the rest, it's pretty much catch as catch can. The first of these two CDs contains the concertos. The Mozart comes from the collection of Deutsche Rundfunkarchiv, and is a broadcast performance from April 3, 1939. A German announcer gets things off to a jarring start (jarring, at least, if you were expecting Mozart's gracious C-major opening instead! ), but he soon gets out of the way and allows Kempff to make his quiet magic. The Leipzig orchestra is functional rather than distinguished, but Kempff sounds at peace with the music, and as a result, so are we. The "Emperor" was recorded in 1936 for Deutsche Grammophon. This too is a "live" performance, as the applause at the end indicates. This is an "Emperor" with punch, although it is the Berlin Philharmonic that strikes the more aggressive note. Kempff is most distinctive when he is most intimate; he was a master of the mezzo piano and all the dynamic gradations that surrounded it. Nevertheless, the interesting thing about the outer movements, as Kempff plays them, is their playful spirit – the Greek gods are playing ball on Mount Olympus. The slightly faded sonics don't obscure the masculine beauty of Kempff's tone. The second CD contains broadcast recordings from the Norddeutscher Rundfunk in Hamburg. Eight of the selections were recorded on August 18, 1945 and the other five of the selections are from October 10 of that same year. The sound is unexpectedly fine on this second disc. (Maggi Payne did "Technical reconstruction" for this set.) As with the first disc, the repertoire is no surprise; Bach, Chopin, and Liszt remained an important part of Kempff's repertoire for decades. The Fauré Nocturne is more unusual. Kempff plays it memorably well, with sentiment but no bathos, and with a finger pointed towards Liszt. If German pianists have a reputation for being cold fish, this reputation is belied by playing such as this. Given their broadcast origins, these recordings do not offer note-perfect performances – how could they? They do preserve some of Kempff's earlier work (although he was already 50 in 1945), and they prove that he didn't need the isolation and concentration of the recording studio to make himself one with the music that he was playing. 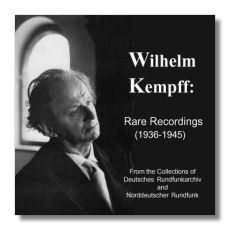 Dedication and class without egotism – that was Wilhelm Kempff. Thanks to Music & Arts for bringing us rare recordings that really did deserve to be brought to light.